The Mon Ami™ Web Portal is the gateway and link for caregivers, family and friends to remotely assist, manage and monitor the well being and quality of life of the Mon Ami™ user. The Mon Ami™ Web Portal can be accessed anywhere there is an Internet connection via any standard modern web browser such as Microsoft Internet Explorer™ or Firefox™. It may be accessed from anywhere in the world at any time of the day or night. It is safe and secure as it does not allow direct access to Mon Ami™. Rather, all transactions with the Mon Ami™ unit are conducted through encrypted channels. The menus and functions that the Mon Ami™ Web Portal offers are simple and intuitive and facilitated through the use of wizards and prompts. One does not have to be an ‘expert’ to use the Web Portal. The Web Portal itself is divided into sections, each with its own tab, making it easy to focus in on the task at hand. 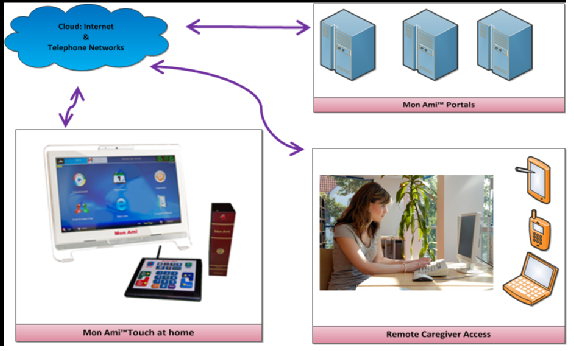 Mon Ami™ is an extensible platform and also the end point, with the Web Portal acting as the conduit for the caregivers and family to share information, music, books, memories, and much more. The Web Portal itself is evolving to form the social and support network that Mon Ami™ is all about. The Web Portal can be used by professional caregivers to provide up-to-date and ongoing support for their clients. This could never be possible with the traditional type of caregiving that requires in-person visiting. Certainly, hands-on tasks must still be done in person, but background support can lead to improvement in the daily lives of the Caregiver and the people in their care. With the Mon Ami™ Web Portal, both the client and the Caregiver win. Also remember that with Mon Ami™ you are never alone! Check out our Day in the Life of a Mon Ami™ User and Day in the Life of a Mon Ami™ Caregiver pages!